We, along with our cultures and heritages and history, come from all over! Many of our cultures came from different places in the world even. Yet, our cultures are also a part of the history and of the today in our church, society, and all of creation! At La Luz del Mundo (The Light of the World) we get to do some cool stuff like arts and crafts, games, puzzles, and we will have the opportunity to learn more about and experience cultures and heritages and histories that may not be as familiar to us as our own, and see how they fit in as a part of La Luz del Mundo! 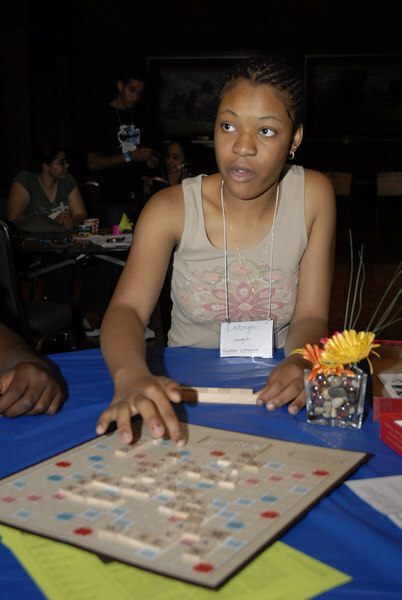 Latoya Brown contemplates her next move in a game of Scrabble at the Multicultural Youth Leadership Event, part of the 2006 ELCA Youth Gathering.